For a taste of home-cooked dumplings without the prep work, look no further than these dumplings with chicken to bring fresh-tasting country goodness to your restaurant or diner! These Southern-style, square, flat dumplings feature tender, natural proportion diced chicken meat. Both the dumplings and the chicken are slowly cooked in a mildly seasoned chicken broth to attain the best possible flavor. A good source of protein, these dumplings with chicken are great for a number of entrees! 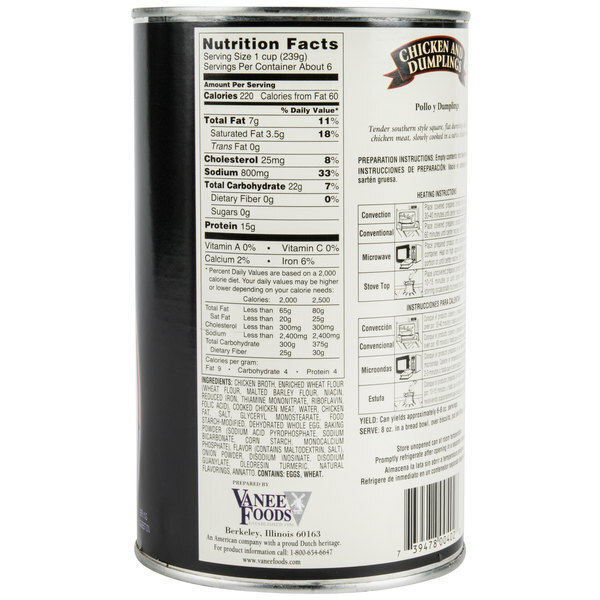 Use this product over warm and flaky biscuits. Or, use it as an ingredient in pot pie filling, soups, or casseroles. Treat customers to the comforting taste of dumplings with chicken, reminiscent of home-cooked meals, while served from your restaurant or diner. A great home style chicken and dumplings at a great price. They are easy to prepare and tastes wonderful. They will be loved by you customers and are great on a buffet. The can dumplings with chicken is a comfort food indeed. The dumplings are cooked to perfection and the chicken is nice and tender. A great way to fix a quick and tasty lunch. A wonderful quality dumplings with chicken at an exceptional price. The dumplings are great on our buffet and taste like authentic homemade dumplings. They are seasoned perfectly and the chicken is so tender. YUMMY! 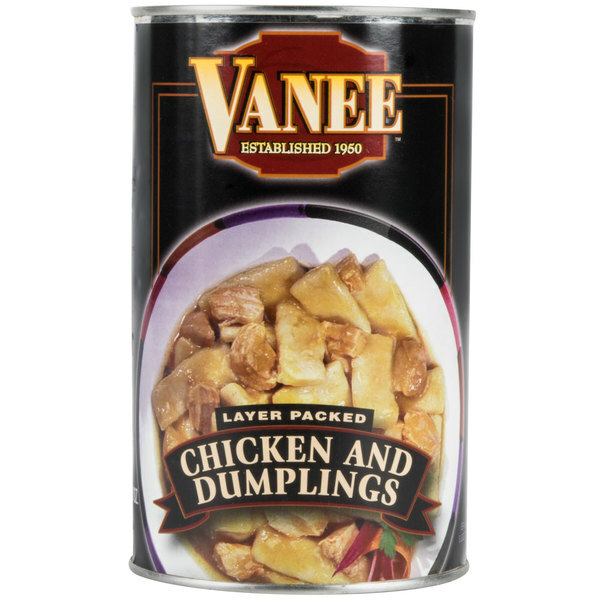 This is the classic comfort food dish that fills any family's stomach ,50 oz size can full of chicken and home style dumplings like the Amish make . Very tasty in a chicken gravy priced right. It isn't comparable to homemade but it isn't bad. It is quite good for the convenience and cost. This is great to have on hand for a quick and easy meal. It is filling. This is surprisingly good. I don't normally buy canned food like this, but thought it would be good to have a couple on hand for emergency's or late nights.. it had good reviews so i took a chance. Well as it turns out, the reviews were right. The chicken tasted very fresh and the dumplings were very close to what I make. I added some fresh steamed carrots and extra pepper and we couldn't believe how good it was! Being by myself I made three separate meals out of one can. It has a good amount of chicken and plenty of thick dumplings. Just like mom used to make. Thick and hearty, very nice flavor. One can fed three 170lb six foot males with no problems. Great to have on hand for last minute suppers. We work a farmers market in the season we are doing a hot food cart this year this will be one item it has good taste and texture you can add some cooked veggies to bulk it up but it is wonderful straight out of can. Dumplings with Chicken – 50 oz. Can- These are wonderful. They have a great flavor and an awesome low price. I would recommend them to anyone. A very affordable quick easy meal. Nice dumplings with moist tender chicken pieces. Just heat it up and you have a meal ready to eat. I have used this Chicken & Dumplings as a Quick meal there are plenty of dumplings the chicken has a fresh taste and it is easy to make. This stuff is delicious! Even tastes like it's homemade. Added a can of carrots, and seasoned to taste, and dinner was served in under 10 minutes. It came out to be like a very thick Soup, which I'm a big fan of. One can was enough for the entire family, everyone enjoyed it. Highly recommended.